This cold pressed Organic Olive Oil is highly coveted for its deeply moisturizing and anti-ageing properties. Make it a valuable addition to the daily beauty routine as its versatile and vital nutrients are essential for lovely hair. Olive oil soothes the scalp, moisturises hair, naturally providing them with a radiant, refreshing and penetrating look. Explore the entire range of Massage / Carrier Oils available on Nykaa. 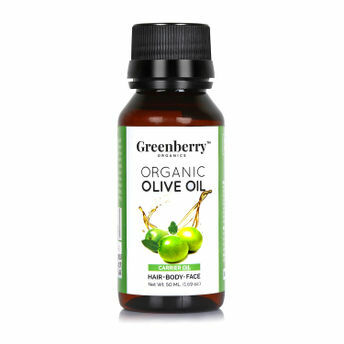 Shop more Greenberry Organics products here.You can browse through the complete world of Greenberry Organics Massage / Carrier Oils .Alternatively, you can also find many more products from the Greenberry Organics Organic Olive Oil For Face Body & Hair range.